Geographical Range: Yunnan Province in China, Northern Thailand and India. Diet in the Wild:Earthworms, pieces of fish and lean red meat. · The crocodile salamander is small, averaging between 6 and 8 inches in length. · Have tubercles on rib peaks. 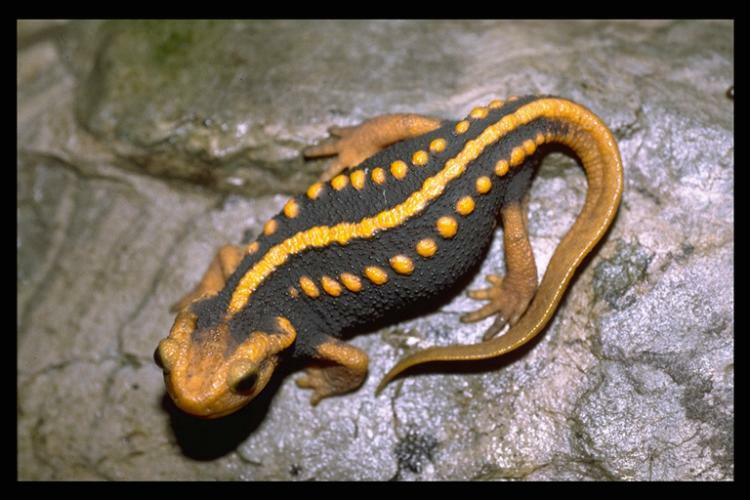 · Crocodile Salamanders have orange-brown heads and tails. · Tail is long. · Dark brownish-black color with orange or yellow pigment on the head. Crocodile Salamanders are aquatic and terrestrial. They are very active. During most of the year, these newts will usually remain aquatic. And like most newts, they have a very keen sense of smell, which enables to find uneaten food. Humans use the salamander for medicinal purposes by drying it and many of these salamanders are caught each year for their colorful skin to be traded in the pet industry. The salamander has a life span of 12 years. They are nocturnal, timid and non aggressive. Crocodiles Newts can reach sexual maturity in a year, usually whenever they are about five inches in length. Males are usually more brightly colored than females. The tail of the male is usually larger than that of the female. The Crocodile Salamander live primarily in mountain forests and foothills of mountains, often resting on roots or branches hanging over the water. 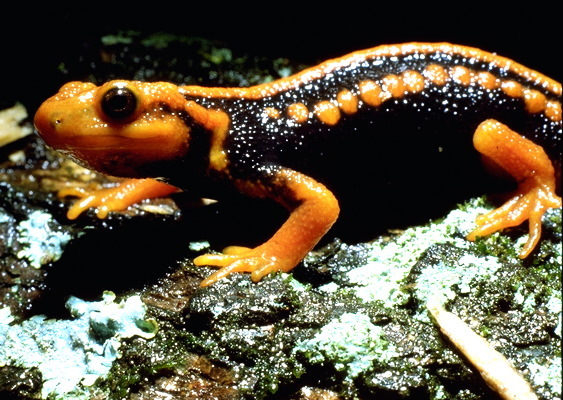 If disturbed or threatened, the salamander will drop into the water and quickly swim away. The crocodile salamander has a long tail that help it to swim through the water. Their keen sense of smell allow it to search for food. They reproduce sexually, laying fertilized eggs. The Fort Worth Zoo houses one crocodile salamander. Due to its small size, the class carefully concluded that it was a baby salamander. Its habitat in the Herpetarium includes lots of vegetation with a small body of water in the middle. During the day, when it was visited it hid between the bushes. It was trying to avoid being by avoiding the light. It is active and measures about three inches. Crocodile Newts are not reluctant feeders, and large females can consume a considerable amount of food. The Crocodile Salamander is the most aquatic of the four species of crocodile newt. 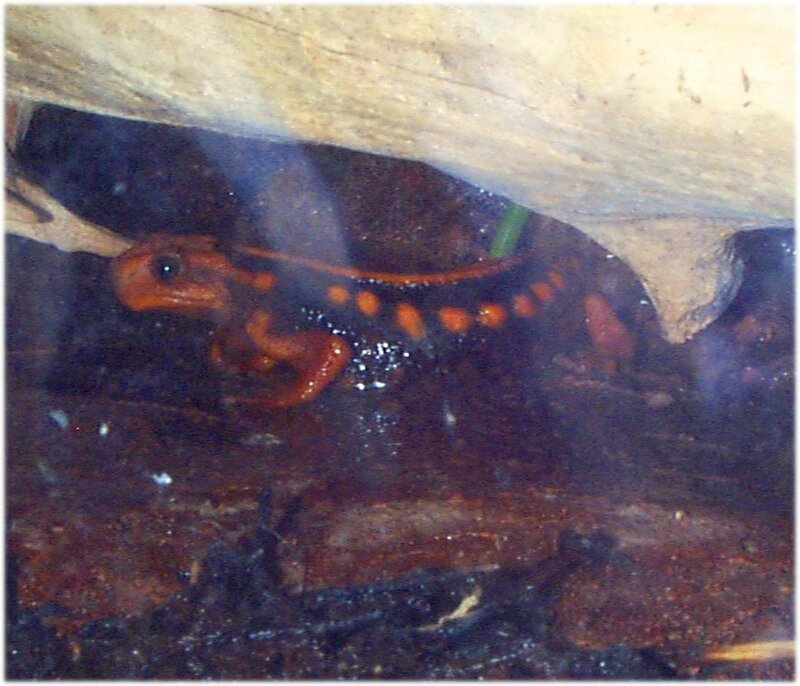 In the summer and autumn months the salamander will usually remain in the water and would rarely emerge. Also the Crocodile Newt is nocturnal, doing most of its hunting at night and remaining inactive during the day. Grzimek, Bernhardt. Grzimek Animal Life Encyclopedia. Van Nostrand Reinhold Company: New York, New York, 1974.